Extroverts and Introverts. Can we be friends? With each other?!! I have a friend who’s birthday is coming up soon, and as such we were recently discussing upcoming plans for her celebration. She couldn’t decide if it was best to host one big event, or if it would be more appropriate to hold separate gatherings. One for her work friends, one for her book club, one for her long standing friends etc…. I would tend to consider myself a bit introverted, or perhaps in the extreme moments with close friends, perhaps a slightly extroverted introvert. (I know I have at least one friend who is scoffing at the idea that I am an introvert and questioning if I know the meaning of the word! Lol I do, I promise! haha) As my friend planned this big event, I pondered if my friend might be an extrovert. When I put this to her, she denied it, and we settled on an introverted extrovert to summarise her social character. I love that she will entertain these conversations with me. I have always found this friend fascinating, and we have had difficulties in the past because I struggled to understand her social style. It lead me to the question…. Can introverts and extroverts (or differing variations of the 2) make a friendship work? I wont lie to you, and I am sure my friend would agree, it isn’t always easy. The idea of such a large gathering of people exhausts me, even in context of all of my own friends. I’d feel like I spent the whole event making sure I spoke to everybody and walk away feeling like I had spoken to nobody. As an introvert I prefer small groups, usually consisting of only myself and the other party. I thrive on deeper conversations and enjoy searching for the meaning of certain happenings and relationships. I feel you need that privacy to really get to know people, and to allow them to get to know you in return. My friend, however, seems to be drawn to group situations. Where they drain me, they perhaps energise her. The fun light atmosphere is more welcoming, and engaging and not so heavily conversation focused, but event focused. Not everything about the idea appealed to my friend, and it did provoke some anxiety, for example, when thinking about the intermingling dynamics of all the sub groups, which is why she is perhaps a bit of an introverted extrovert. All the same, it became clearer to me in that moment how special our time together is. Not only does my friend not invite me, but she will make time to celebrate her birthday with me all the same. With just her and I. She will engage in meaningful conversations, and yet bring enough extroverted energy to the table that we still share plenty of laughs to lighten the mood. (You know, because I'm so unfunny!! :P haha) She will tolerate it when I stay too late, and pretend to like everything I give her as a gift, (even though I have basically bought her all things I like, only in a colour she likes,) and turn a blind eye when I blog about the experience later. (In return, I ignore it when her fur baby tries to suffocate me at the drive in or gnaw my limbs off at her house! Lol) She is not the kind of friend I can call on to see, or maybe even to speak to, every week. That kind of commitment makes her feel intolerably trapped, and I used to feel that she kept me at a distance because of this. To someone like me, time is closeness. Now I have to wonder if we are not actually already closer than I think…. In reflection it is possible she gives me more of herself than I appreciate. 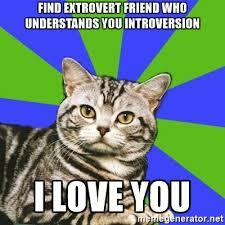 To answer the question, can extroverts and introverts be friends? With some consideration of the other person and how they feel energized and drained, yes. As with all friendships, your best bet is to relate to the other person THEIR way and acknowledge their strengths, weaknesses, boundaries and limitations. I’ve never really acknowledged before the way my friend seamlessly accommodates my needs, probably at quite the cost to her own emotional energy, so here is a shout out to her for her patience. Thank you! I know sometimes I drain you, (sorry) or sometimes you just don’t have the energy for me. I understand. In return I really manage my expectations of you, which I hope you equally appreciate. I no longer try to push (consciously) for more closeness than you are comfortable with and try very hard to go with your much more relaxed flow! Keep smiling, and providing food for friendship thought! Newer PostCopy of Friendship is the healthiest Easter treat, and it’s sweet like chocolate too! Older PostFamily First, Friends Always!